From the weakening of the ecological system to the governance of the common good, the Barents region has experienced a significant shift in the last 30 years. The joint cooperation between Norway and Russia has been exemplary in several aspects. Despite geopolitical tensions, both countries keep an active cooperation when it comes to environmental safety in the Barents Sea. Nuclear safety, fisheries management, reducing risks of various pollutants (e.g. Sulfur dioxide emissions), all these aspects have triggered a lot of attention in these bilateral relations. Indeed, these significant issues for both the local ecosystem and human safety can be depicted in the dynamics of the Anthropocene. The Anthropocene refers to a stage in which “human activities have become so pervasive and profound that they rival the great forces of Nature and are pushing the Earth into planetary terra incognita” (Crutzen et al., 2007). In that context of geological transformation, the question of responsibility appears to be completely mutated by this new era “because of the scale of human intervention in earth systems science” (Latour, 2018). As for the Barents region, the connection between humans and nonhumans is deeply bound to a local socio-economic structure. Closely intertwined, it impacts the ecosystem dynamics. At some point, it illustrates the ability for this part of the Arctic area to be a stunning example of a long-term governance. The Barents Sea is challenged by two dramatic human factors. On the one hand, nuclear activities stand as a serious threat for the local ecosystem. For several decades nuclear activities undertaken by the Soviet Union, then Russia, took on various dimensions from military to civil use. On the other hand, fisheries are a cornerstone of local socio-economic life in the area. Both Norway and Russia have openly cooperated on these issues. 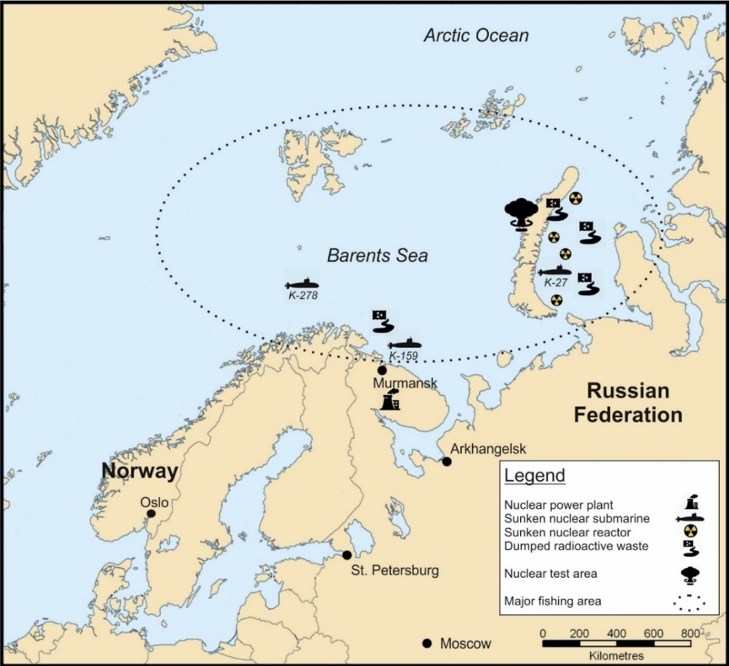 The Barents area experienced significant radioactive contamination through atmospheric nuclear tests in the 1950s and 1960s, as well as from dumped radioactive reactors close to the Novaya Zemlya archipelago (figure 1). The nuclear accident in Chernobyl (1986) could be seen as a psychological shift for Norwegian civil society. But, the accident of the Soviet submarine Komsomolets (class K-278) on April 7, 1989 was a game changer for the whole Norwegian political class. Following the fall of the Soviet Union, this issue has been set at the top of the agenda by the Norwegian authorities. They have established good contact and maintained a positive atmosphere with their Russian counterparts. Since then, they jointly shaped a coordinated policy in the Barents region. Nevertheless, uncertainties about nuclear safety resurfaced at regular intervals. 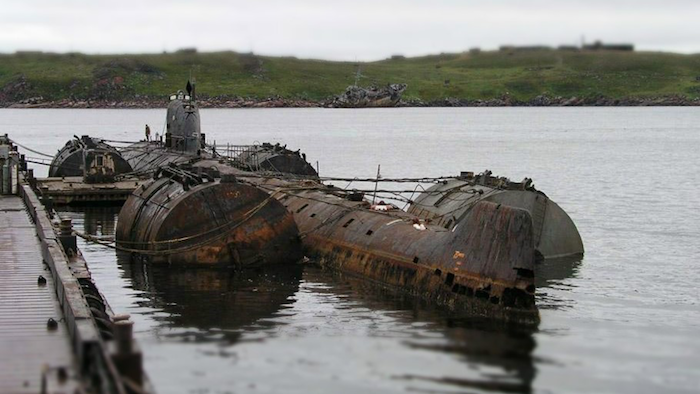 The shipwrecks of the Russian nuclear-powered submarines Kursk and K-159 in 2000 and 2003 respectively reminded the Norwegian authorities of the huge risk of a massive release of radioactive waste resulting from such an accident. Besides, the management of the Kola Nuclear Power Plant, located in the Murmansk oblast, raises serious concerns as Rosatom intends to maintain its oldest reactor. Running for 45 years, they aim to run it for an additional 15 years. Rosatom confirmed that decision in April 2018 by shutting down the reactor (VVER-440 type) for major upgrades during a 195-day period. Ultimately, this nuclear power plant will operate up to 60 years. Each reactor of the Kola NPP was initially designed to run for 30 years but still the four reactors are working on extended engineering lifespans (Kireeva, 2016). Moreover, the area faces strong pressure on fisheries activities as climate change seems poised to alter the ocean ecosystem. Indeed, the combined effects of a changing climate on ocean dynamics and food web processes threaten marine resources, and, so, fisheries in these high latitudes. More significantly in the light of major uncertainties, the main question implies in what manner the assumed climate-driven physical changes may alter the ecosystem. Undeniably, it raises implications and future challenges that could represent for the management of the resources in the area (Haug et al. 2009). The coming disruption of fisheries stocks may upset the existing cooperation between Norway and Russia in the near future. Indeed, with a warming Arctic Ocean, fish stocks are likely to move to higher latitudes. As a result, the Central Arctic Ocean stands to witness a potential fish stock gold rush. Indeed, fish stocks in other ocean areas are dramatically depleting. Sustainable fisheries can only result from joint consistent effort over time rather than hurried fixes. At the moment, Norway and Russia have built a common approach relying on robust scientific knowledge and comprehensive regulations of fisheries activities in the Barents Sea. In addition, to ensure the achievement of this policy, a strict enforcement stands as the best guarantee for it. Unquestionably, fisheries management stands as an example of successful bilateral governance in the Barents region. Both countries jointly worked since the 1970s to regulate activities through allocation of resources and distribution of quotas for key species in the area (i.e. cod and haddock). Above and beyond, the establishment of the Joint Norwegian–Russian Fisheries Commission (1976) facilitated the enhancement of regulatory effectiveness in order to ensure the sustainability of fish stocks in the Barents Sea. For example, the catch quotas have been brought down to levels in line with sustainable fish stocks. Another tremendous success of fisheries governance is related to the fight against illegal fishing. As for now, it has been eradicated in the Barents Sea following a close effort led under the supervision of this Joint Commission. This noteworthy bilateral success is based on a combination of enforcement cooperation between Norway and Russia, enhanced enforcement at the domestic level in these two countries, and measures taken by the Northeast Atlantic Fisheries Commission (NEAFC). As for the Norwegian-Russian case, “joint fisheries management stands out as a prime example of the benefits of cross border cooperation on sustainable management” (Hattrem, 2016). Also, a number of regulations of a technical nature pertaining to fishing gear, when to fish and where, are important to the achievement of sustainable fisheries. At the moment, Norway and Russia manage this fragile balance through teamwork and caution. Regarding nuclear safety, trust and confidence have mostly characterized the essence of this cooperation between Norway and Russia. But it has been a long process as Norwegians had to uncover the extent of nuclear waste dumping in the Barents and Kara seas (MacKenzie, 1993). The negotiations and discussions that followed these revelations have led to tangible results over the last 20 years. The Norwegian government aims to remember that fact as they allocated up to EUR 230 million (USD 283.7 million) to northwestern Russia (Hattrem, 2016). Putting it all together, the Norwegian authorities, with the support of the civil society organizations such as the Bellona Foundation, succeeded to significantly reduce the threats from one of the largest stocks of fissile materials. These poorly secured stocks are closely located to the Norwegian border. But, a significant step has been made with the removal of spent fuel from 100 nuclear submarine reactors in Andreeva Bay. So far, this process started in 2017. It is worth remembering that area served as the nuclear submarine service base for the Northern Fleet. Is this model of cooperation resilient enough? Since the early 1990s, Norway and Russia have been closely acquainted on these key environmental issues in the Barents Sea. After all, fisheries and nuclear policy have been two sides of the same coin. Indeed, sustainability and conservation have been the core common policy for the regional maritime ecosystem. This bilateral cooperation on environmental issues is a dynamic cornerstone despite the ongoing geopolitical rift over the Ukrainian crisis that started in 2014. This ability to separate the global context from their local strategic interests proves their resiliency to handle complex issues when it comes to the common good in a shared promising area. As a result, both countries succeeded up till now to pursue this collaboration as it aims to benefit their mutual interests. In that respect, an unforeseeable challenge looms to shake this close cooperation. With increasing global warming effects on Arctic waters, impacts on the living marine resources are going to significantly transform the area in the coming decades. Fisheries management cooperation will be openly tested in the medium and long term. The impending local ecosystem transformation may endanger this designed joint governance as fish stocks would shift into new marine areas and disrupt the ecological balance. Additionally, the 17,000 dumped radioactive containers laying in the seabed are also a potential disaster, creating a minefield for oil companies looking to drill in the area. Particularly because there is no mapping regarding the precise locations of most of the containers. At the very least, this threat amounts to a sword of Damocles hanging over local communities living in the region. Besides, it increases uncertainties and unpredictability as the Barents Sea stands as a mirror of the Anthropocene era. This region is under pressure from human activities while it is undoubtedly the most exposed to industrial civilization dynamics in the Arctic. This includes access to resources, militarization, pollution and urbanization. Locked in the man-made technological hubris inherited from the past and the coming display of the “age of consequences”, the Barents region illustrates somehow the fate of this civilization erected from fossil resources. To some extent, it may even appear as a last stand. Certainly, it accumulates all the characteristics of complexity which fit what Latour (2018) called a “critical zone”. Indeed, the eventual purpose would aim to figure out what a critical zone could mean for science and politics in this area, and in the Arctic more broadly. Ultimately, it triggers the emergency for the enhancement of the regional governance in which States would have to cope with an increasing pressure from the Earth System Dynamics (ESD). It requires from key stakeholders greater inventiveness and at some point a psychological break to upgrade the level of confidence and resiliency of this bilateral cooperation. Anthropos is the Greek term for ‘human’. Anthropocene has been coined to capture the emergence of human beings as a natural force at the geological level. Launched on May 9, 1983, the K-278 Komsomolets was the only Project 685 Plavnik (also known by its NATO reporting name of “Mike”-class) nuclear-powered attack submarine of the Soviet Navy. Rosatom also known as the Rosatom State Nuclear Energy Corporation, is a Russian state corporation headquartered in Moscow, Russia. This public company is specialized in nuclear energy and other related nuclear activities. Established in 2007, the company’s structure consists of over 360 enterprises, including scientific research organizations, the nuclear weapons complex, and the world’s only nuclear icebreaker fleet. Bellona was founded in 1986 by Frederic Hauge and Rune Haaland and is based in Oslo, Norway. Initially created as a direct action protest group to curb Norwegian oil and gas industry pollution, it is nowadays a well-established international environmental NGO holding a multi-disciplinary approach on wide topics including climate change, nuclear safety and energy transition. Crutzen, P., McNeil, J. and Steffen, W. (2007). The Anthropocene: Are Humans Now Overwhelming the Great Forces of Nature?. Ambio, 36(8), pp. 614-621. Hauge, T., et al. (2013). Climate effects on the Barents Sea marine living resources. Marine Biology Research. 9(9), pp. 819-821. Florian Vidal is a Ph.D. candidate at the Faculty of Law, Political Science and Economics, Paris Descartes University, France. His working thesis is entitled, “Norway-Russia relations in the Arctic: Perspective and analysis of a regional dynamic in the Anthropocene era”. His primary research interests include Anthropocene and Arctic dynamics, governance of complexity and Northern Europe.